Rachel Patrom is a sophomore majoring in fine arts toward a career as a graphics artist. 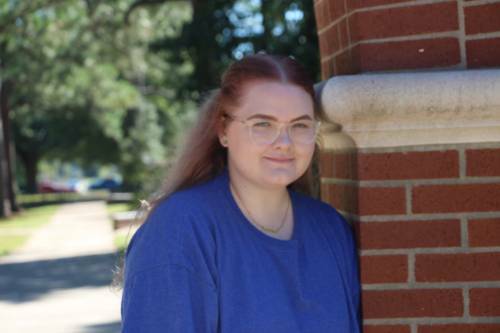 Rachel Patrom, of Beebe, is a sophomore at ASU-Beebe pursuing an associate’s degree in fine arts. Her academic plan after graduating from ASU-Beebe includes transferring to A-State to complete a bachelor’s degree in graphic design. After college, she hopes to work for a company as a graphic designer. In addition to her academic pursuits, Rachel serves as a Resident Assistant in Legacy Hall, is a member of the Student Government Association, serves as President of the Uncharted Publishing Studio, is a member of the Student Leadership Experience and is active as a Student Leadership Scholar. Rachel enjoys sharing her college experience through her involvement in helping with the Upward Bound program during the summer session. Upward Bound provides high school students the opportunity to experience college life as a summer program before graduating high school. In her free time, Rachel enjoys hanging out with friends and family or sneaking in an occasional nap between classes.